AUTO HOVERING - The advanced altitude holding feature allows the mini flying drone to suspend in midair even after letting go of the joystick This makes it an easy-to-maneuver drone and easy to fly for starters, beginners and newbies. Perfect toy drone for children. 720P HD CAMERA - This tiny drone is capable of capturing great HD aerial photos and video footage while it's in the sky. Perfect for simple and fun aerial photography to show friends. 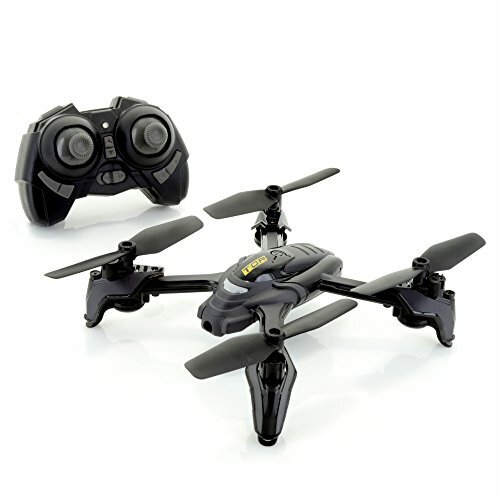 ONE-KEY STUNT MOVE - This mini RC drone has a fun 360 degree rolling feature that makes doing tricks easy with the touch of a button. Make your flights extra impressive with your friends and family. MODULAR BATTERY DESIGN - All new hard case battery design removes the exposed wires for a more durable and long lasting battery. perfect fit for this small drone. 6-AXIS GYRO - Equipped with 6-axis gyro stabilization system for quick recovery after rapid movement.